I’ve been away. 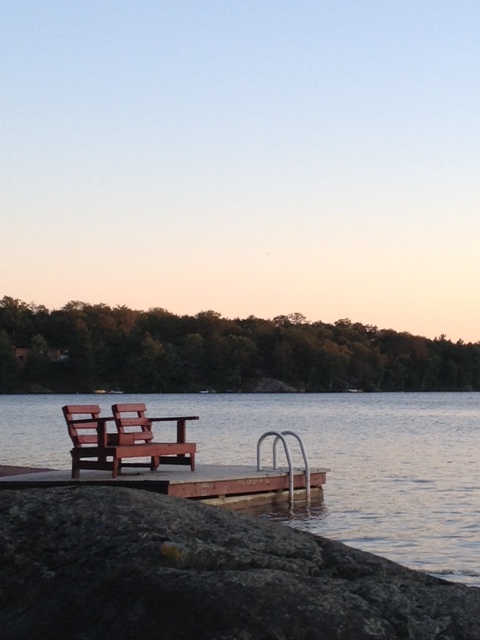 I intentionally took a break from writing while I sat (a la Otis Redding on the dock at right), read, swam, slept at our cottage in Muskoka and contemplated the …………honestly, just did nothing much of anything. I didn’t even have internet access (gasp) unless I trudged in to civilization (the Gravenhurst library) to post there. While trying to get to sleep one night I started to think about wine writing, my unambitious contribution to the mass of writing on the subject and I thought – Get Up and Write About What You’re Thinking! And, this is it. Lately there’s been much thrashing about on the subject of wine reviews. Are they necessary? Understandable? Of value? And, if you’ve been playing along at home, you might remember a rant a few months back that spoke obliquely (Word Power: use it three times and it’s yours) to this subject. Not to pile on again but here’s what I think. As Mike from Cranbrook would say, “one man’s opinion”. 1. Tasting Order – Falafel, Cleanse Palate, Shwarma, Cleanse Palate, Tabouleh, Cleanse Palate, Fattoush, Break For Lunch. 2. Carefully remove falafel from its waxed paper wrapping by turning counter-clockwise 6.5 times and place on paper plate provided free of charge with your course registration (feel free to take plate home to use for home tastings). 3. View the falafel against a white background (that be the plate) and compare to the palate of falafel colours provided in your course materials, pages 24 – 56. Whole wheat or white? 4. Swirl paper plate under your nose. Please choose from the 37 categories of scents that foods wrapped in pita exude. “I’m sensing a spicy component – Cinnamon? Pepper? Anise? No, marjoram! That and distinctive medium-new canola grease accents.” Now, drill down. 6. Spit the chewed up falafel into the spittoon. But as funny as that comparison is, the thing that kept me awake tonight was this – why do those that simply smell, swish and spit get to hold sway on wine? It’s unnatural. The bloggers that I read clearly drink what they’re talking about – I see them nodding but not publicly acknowledging a wee bit of a problem. Love these men and women! “Swallowing is key to understanding wine, I believe”, he says as he takes another sip and swallows. I’ve seen on video the Emperor of Wine, who I actually love to read (which explains my dilemma), review a flight of 7 zillion Bordeaux at one sitting by simply smelling, swishing and spitting, Graphite? On to another. What the hell does graphite matter when you’re not even going to swallow the wine? Red cherry or black cherry? Yes, i want to know what the flavours are but swallow for crying out loud! We most likely don’t and can’t taste wine like that. We enjoy wine by a brief swirl, sniff, sip, swish and gulp. Our evaluation, most importantly (check one): Yuck! Meh? I love this stuff! My first wine tasting was the best example of this because I left the place (a crowded room with 95 wines) with a pretty solid buzz and a poor recollection of the wines that I’d tasted (actually swallowing because I didn’t want to make a mess spitting into a rudely partially-filled stainless steel container with a scarily narrow opening). I learned that wine is ill-suited to and not meant to be lined up in a busy room and subjected to note taking and spitting. Regardless of who’s doing it and whether they’re really good or not. It’s just rude and not fair to the guys and gals that slaved to make the stuff. It’s only giving us a palate confusing or oblique (2 times) introduction to the wine. Don’t get me wrong. 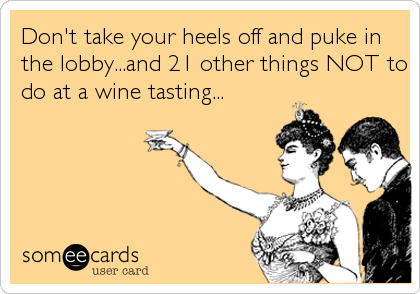 I’m still going to go to tastings; swallowing every sip I take. I want to experience as many wines as I can while staying under the “room is whirling” threshold. So, Bill, why bother reading any of the multitude of wine reviews available? Funny you should ask. Because I think so. Because most of us can’t go to every movie release, every restaurant and try every dish. We depend on others. And, that works best when we get to know some of these others – get to trust or understand their viewpoint. Those who experience life and wine like we do or how we want to. I know that Robert Parker loves Rhone wine more than I do. And, I love them a ton. He tells me what he experiences when he swirls and spits. I get him on the Rhone and have a pretty good idea how the swallow will turn out for me. I can’t go with him in Bordeaux. He doesn’t get me there. And that’s OK. In this way, I know that I can trust The Drunken Cyclist if he suggests a Champagne. I can take it to the bank if The WineGetter promotes a Riesling. If Oenophilogical sings the praises of a Trader Joe’s wine, I wish I was in U.S of A. so that I could pick it up. I may not love the wines like they do but I know what to expect. I like to read them because they don’t take an oblique (bingo!) approach to wine – they are straight forward, understandable yet informed by years of swallowing! There’s substance that we can enjoy and learn from. They swallow! Talk-a-Vino? He swallows cause you can just tell. Grapefriend? I’m betting swallows when by herself or with close family and trusted friends. So, the moral of the story? Drink lots of wine. Don’t believe everything you read in wine journalism, and particularly, here. I love to swallow. Smelling is very nice. Swishing is sublime but I believe that swallowing is also key to experiencing wine. I can’t truly understand a wine without swallowing it. And, frankly, I just don’t want to, regardless of what my doctor suggests. Next post we’ll return to wine reviews and other fun stuff.